So I will start with a confession: dairy-free May failed 😦 However, I would say I at least succeeded in less-dairy May! I did well for about a week or two, but then I really started missing the feta in my salads, had a family party with pizza, etc. Yet I am glad I found the soy shredded cheese, because I think I will continue to use that in place of typical shredded cheese in many recipes! With that in mind, here is this week’s recipe, a tried-and-true favorite of mine (but it does contain dairy)! I have recently been making it with spaghetti squash, but I have also made it with traditional pasta and it is just as good. It’s a very filling dish with a tasty sauce that is easy to make and gets in some veggies as well as lean protein. 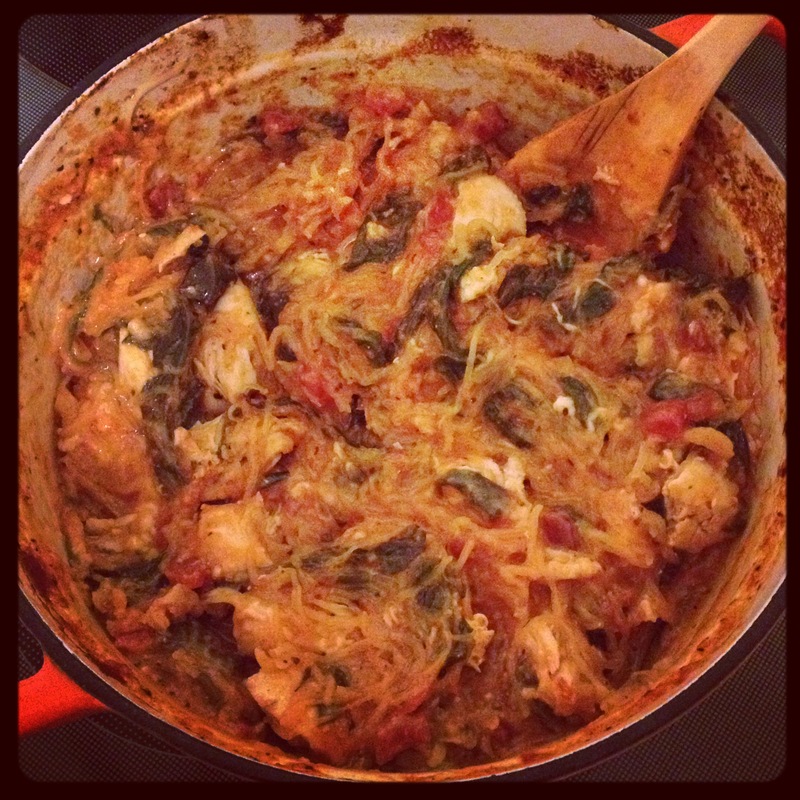 And if you use spaghetti squash, it’s very low carb! I usually bake spaghetti squash, but this time I tried it on the crock pot since I had recently seen it done on Instagram…I thought it was much easier since I could cook it the day before. It does get a little mushy, but I still liked the taste! I put instructions below for both squash cooking methods. 1.) Heat oven to 375 degrees F. Cook pasta**. 2.) 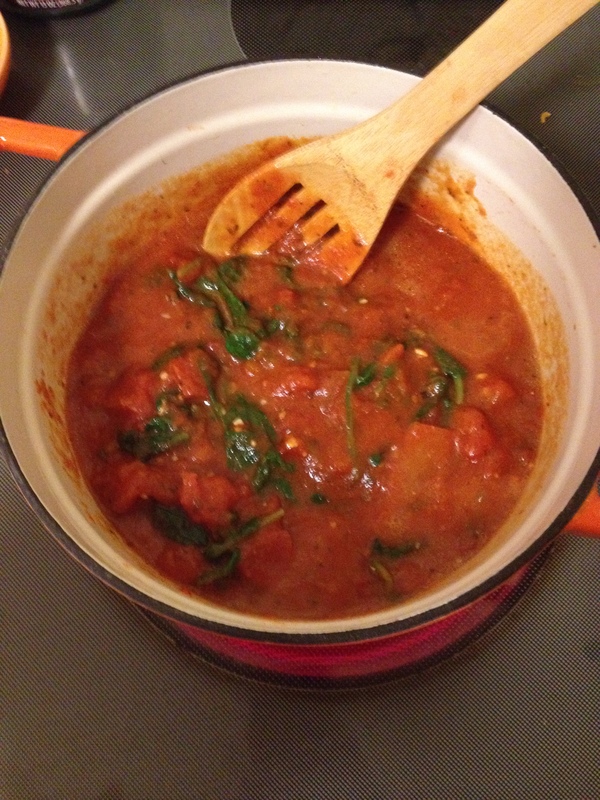 Heat olive oil and minced garlic in large skillet on med high heat, add spinach and cook until wilted. 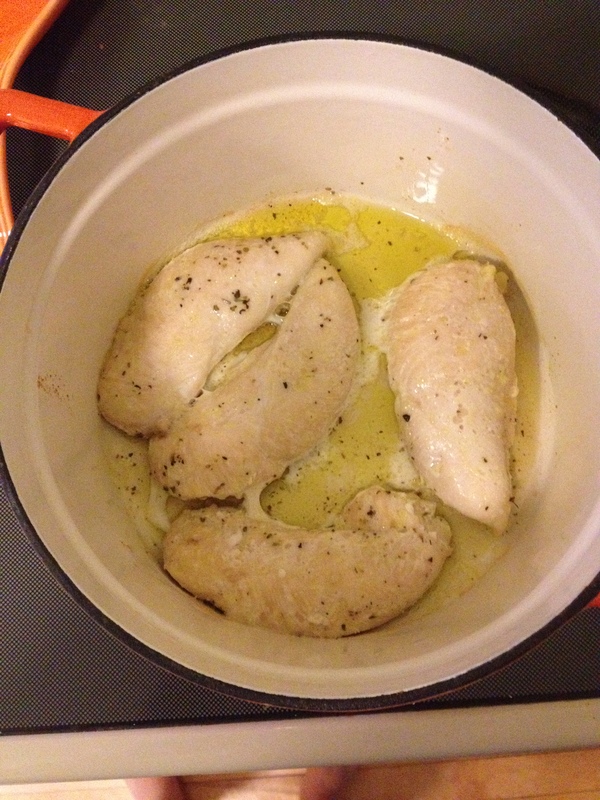 Add chicken (if raw) and basil, cook for about 3 minutes. Add sauce and tomatoes, bring to a boil. Simmer until chicken is done, then cut into bite size pieces. Stir in cream cheese. 3.) 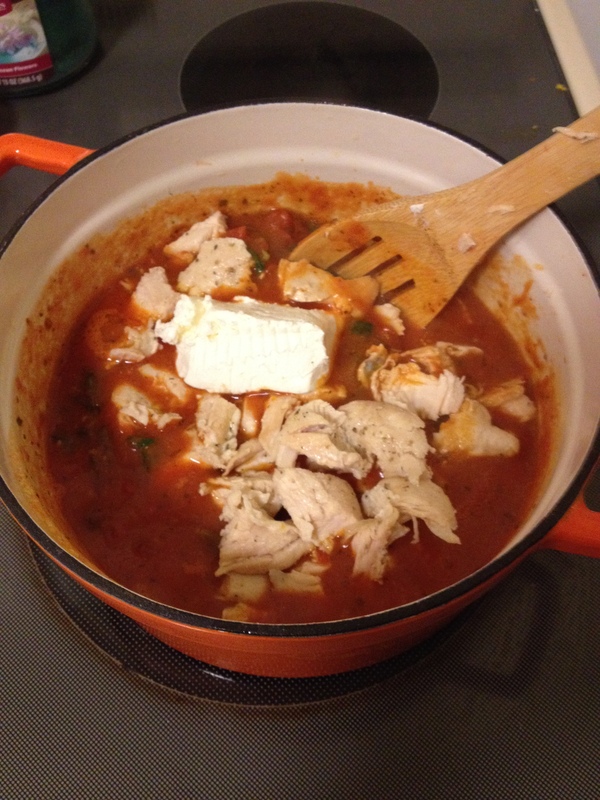 Drain pasta, pour into baking dish/Dutch oven (if chicken was pre-cooked, add bite-sized pieces of it here). Stir in sauce mixture with a handful of shredded cheese. 4.) Bake for 20 minutes or until bubbly. 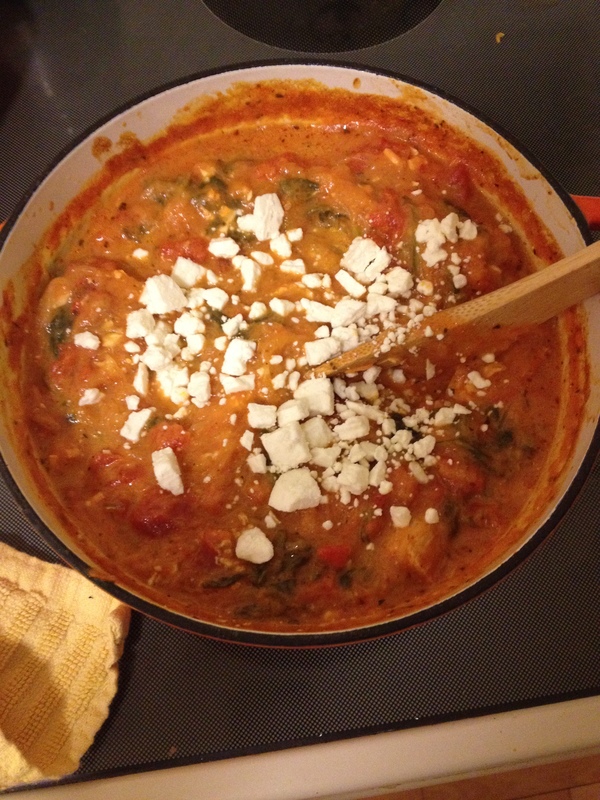 Sprinkle mozzarella and Parmesan/Feta cheese on top and bake for another 3-4 minutes. 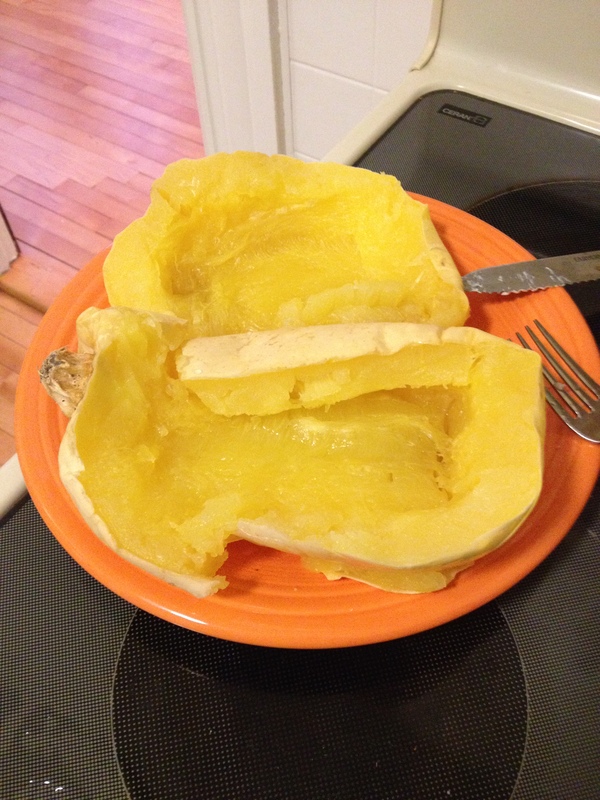 Oven directions: cut a spaghetti squash in half lengthwise, scoop out seeds and pulp in middle. Heat oven to 400 degrees F. Spray/brush olive oil and salt and pepper onto the inside of each half. Lay each half of the squash, open side down, on the sheet. Bake for about 45 minutes until the sides/bottom get slightly brown, the flesh can be easily poked, and the insides can be easily scraped out with a fork. Let cool. Scrape out all the “spaghetti” and put into a pasta strainer lined with paper towels to soak up excess water. Then use in place of pasta! 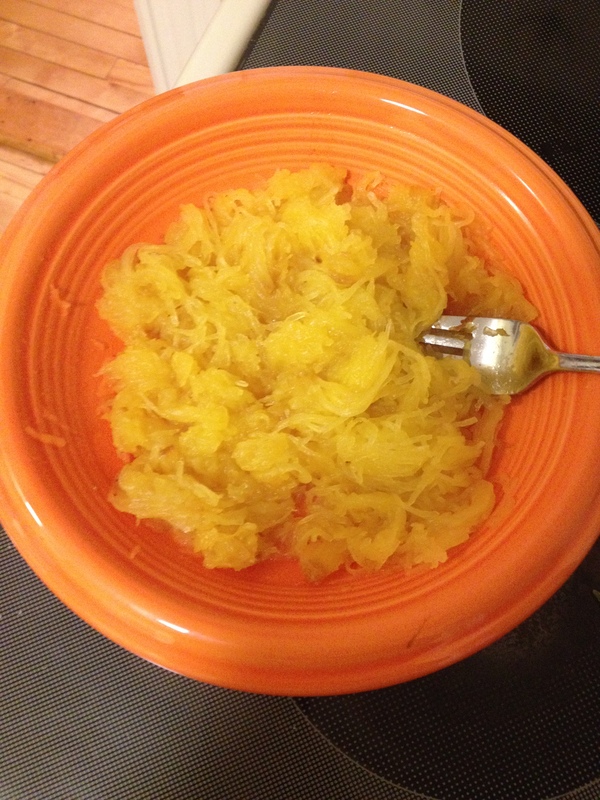 Crock pot directions: cut a spaghetti squash in half lengthwise, scoop out seeds and pulp in middle. Put both halves into crock pot, open sides touching, with 1/2 inch water in the bottom. Cook on high for 2.5 hours (don’t overcook, it will get really soggy!) Take halves out with tongs and let cool. Scrape out all the “spaghetti” and put into a pasta strainer lined with paper towels to soak up excess water. Then use in place of pasta! Also, my sister sent me this article written by a fellow dietitian (I say fellow like I already am one); it is definitely a true and interesting read about nutrition and diet “fads” and why people think they may be doing something healthy that isn’t working!